​Women of every age, height, weight, and activity level have at least one thing in common: Women need to think about things men don’t need to. When considering supplements, women need to balance the need of bones, babies, and bellies, and hormonal cycles. At OLIMEDICS, we rely on science, not guess, not myth. 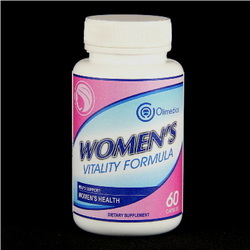 This OLIMEDICS branded women-specific formula is designed to bring you the benefits of advanced nutritional science in convenient capsules. This is a proprietary blend of ingredients formulated to help support hormone regulation naturally. Soy Isoflavones, Black Cohosh, Dong Quai, Licorice, Vitex Berry, Red Clover, Sage, False Unicorn, Squaw Vine, Blessed Thistle, Red Raspberry, AND Mexican Wild Yam.